Welcome to Scoreboard Pressure’s first golf scoreboard, courtesy of The Leon Old Golf Collection. And what a scoreboard it is! Such detail. You could spend all day with your back to the action reading this board. Note, to the right, the leader-board, on glorious blackboard and in wonderful chalk. 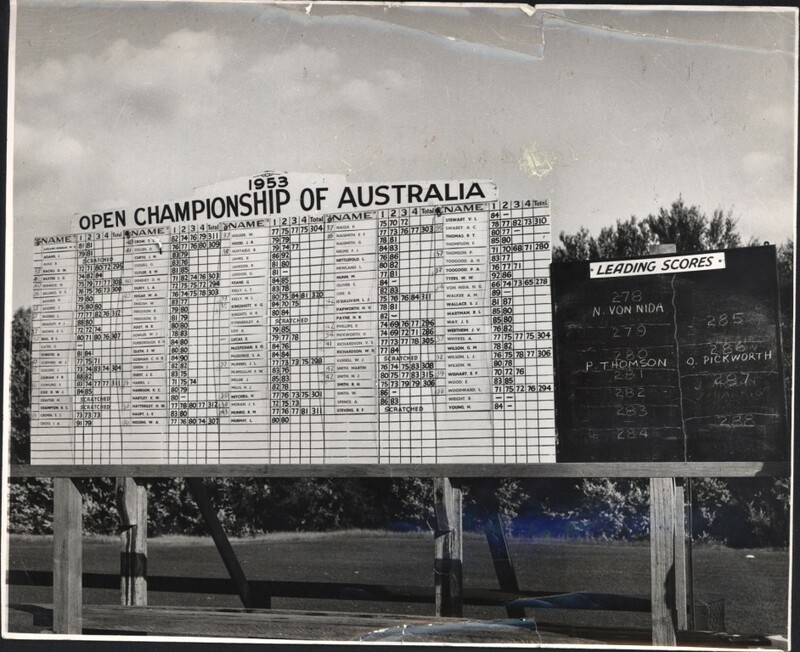 The 1953 Open Championship of Australia was played in late October and won by by two strokes by Norman von Nida, who had started the last day four strokes behind Peter Thomson. von Nida shot a 65 in the last round for a score of 278, Thomson a 71 to finish with 280. Ossie Pickworth finished third on 286, with Kel Nagle fourth on 290. ‘The Von’ collected a winner’s cheque of 150 pounds. The scores shown in those days appeared to be by total strokes, rather than against par, as is the case these days. First tournament I saw was in 1968, and I seem to recall that was how it was done. Anyone have any recollection?